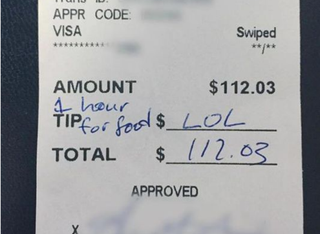 We have a very strong new contender for Worst Restaurant Customer of 2015. My experience with this table was cruel and unnecessary but sadly it’s not uncommon. With that said: Please be good to your waiters. I know it’s annoying when things aren’t right. I know how aggravating it is to receive a hefty bill when all night you’ve been wondering why the table that came in after you was served before you. But waiters are mere messengers most of the time, and it’s wrong to shoot them, however bad the news. Lead image via Jess Jones/Asbury Park Press. Other image via pingu2004/Shutterstock.